Soaking in a bath is a luxury we all need to take. 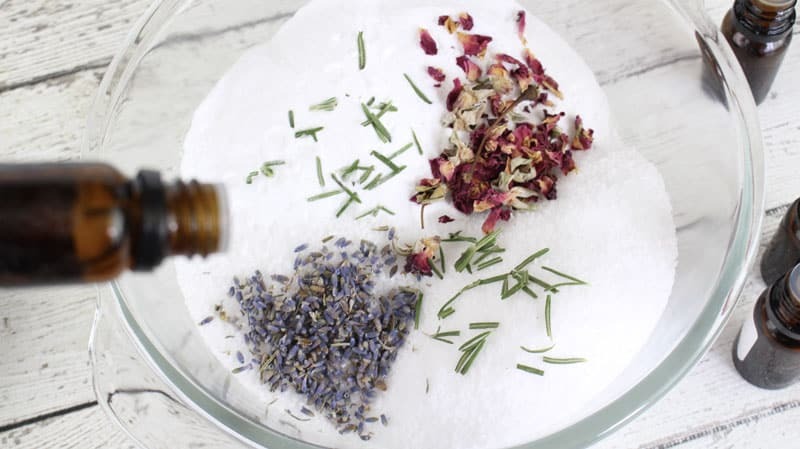 This DIY bath soak recipe will have you relaxed in no time. 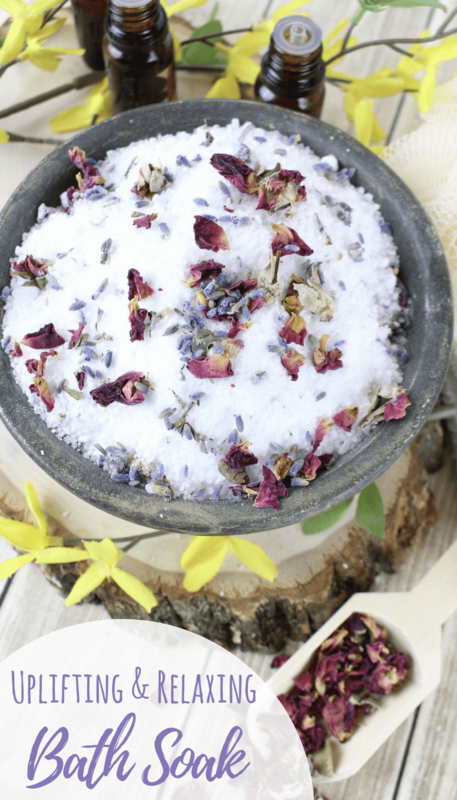 As I'm sitting here typing up this recipe, I am dying to go take a bath and toss in this amazingly relaxing bath soak. People these days are super busy, stressed out and anxious. As moms especially we get busy taking care of everyone else, we rarely stop to take care of ourselves. That's why I love sharing simple DIY recipes with you to help you stop and pamper yourself a little bit. 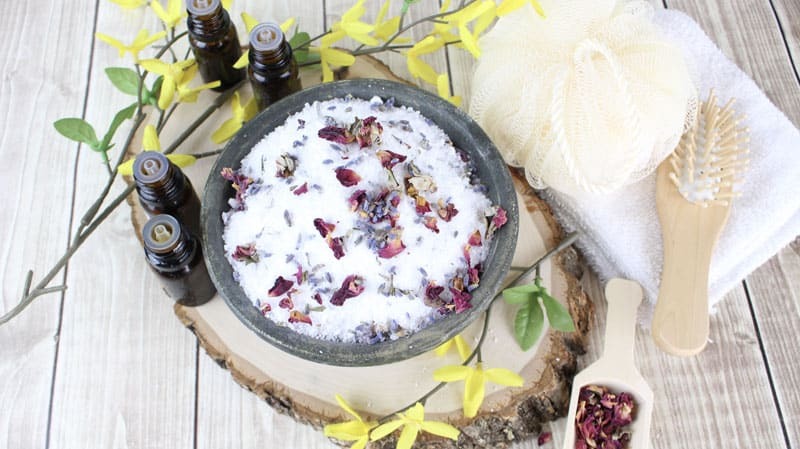 So what is so special about DIY bath soak recipes? 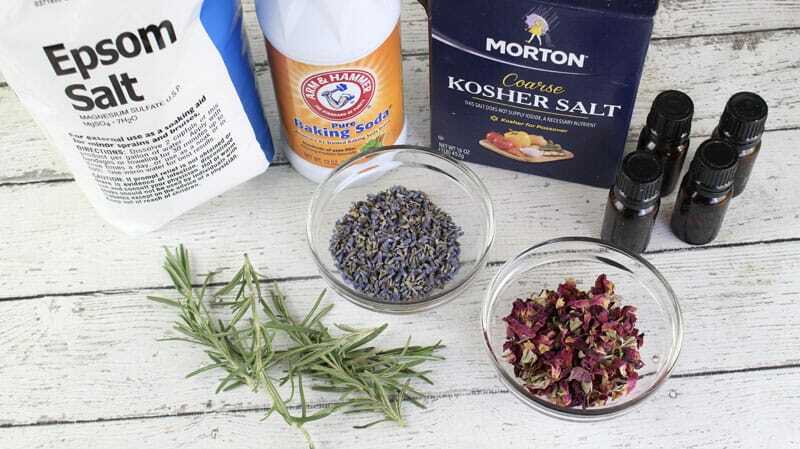 Adding some Epsom salts to your bath is a great way to detox the body, but adding a few more simple ingredients can really just take it to the next level. Essential oils can create amazing results simply through their scent or aroma. 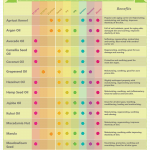 Inhaling the essential oils can offer a range of health benefits. For example, it can clear the sinuses and relieve respiratory congestion. Our sense of smell is more powerful than we know; it registers all sorts of scents throughout the day. 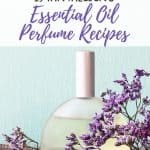 If you’ve ever noticed how your mood changes when you smell coffee brewing or a cake baking, you will understand that aromatherapy can also enhance mood. Essential oils are used individually for many purposes. However, the real power will often come when they are blended to create certain mood enhancing, relaxing and healing effects. You can use some oils like eucalyptus on their own to help a person unclog their sinuses, for instance. Lavender and Lemon soothe and relax. There are also energizing oils, ones that can improve sleep, and even ones that help with weight loss. Citrus oils are usually the most invigorating, especially lemon, orange, and grapefruit. 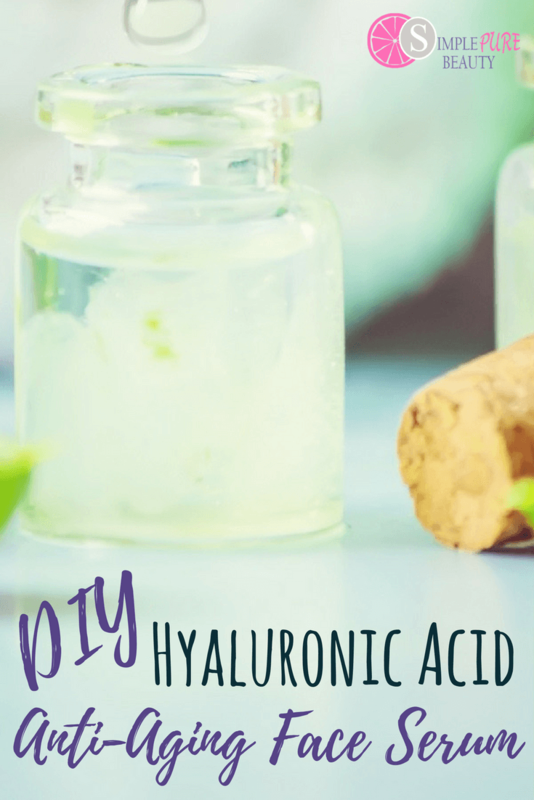 There are several essential oils in this recipe blended together to really uplift your spirits while creating a relaxing environment. The salt will really help detoxify the body as the baking soda neutralizes chlorine in the water creating the perfect atmosphere for true relaxation. If you do not have the dried flowers, it is ok to leave them out. If you are worried about making a mess in the bathtub, simply add the bath soak to a muslin bag like this one. 1. Add the Epsom salt, coarse salt and baking soda to a medium mixing bowl. Whisk to combine. 2. Add all of the essential oils and whisk again to distribute the oils. 3. Add the rose and lavender buds and stir well. 4. Transfer to an airtight container and store up to six months. 1. Add 1/4 cup of bath salts to your warm/hot bath water. 2. Use your hand to circulate the salts and allow the essential oils to activate with the steam. 3. Sit back and enjoy the uplifting spring aromas of rosemary, lemongrass, rose-geranium and lavender! 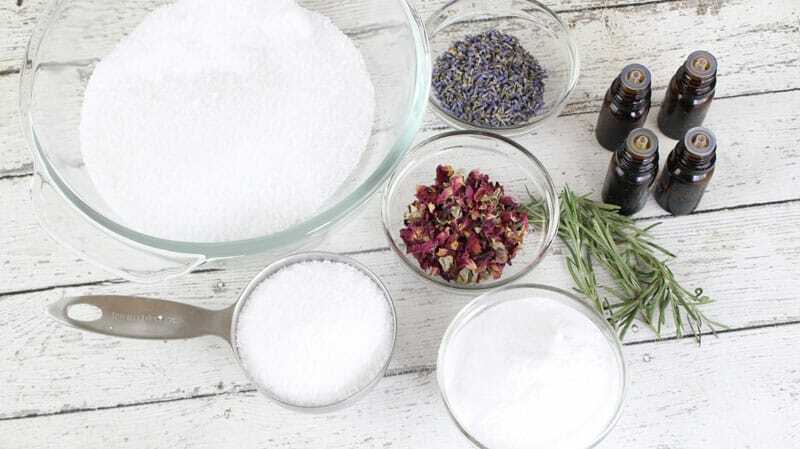 Have you tried a bath soak before? What essential oils are your favorite to add? 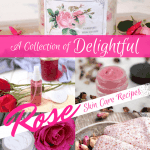 you’re oils recipes look delightful. thank you for posting. 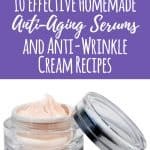 I’ve recently searched “eye cream with essential oils” online and I found out your recipes are really great! I haven’t tried a bath soak before and would like to give this recipe a try :)) but there’s a question… what’s baking soda for? Is it necessary? Thanks for your reply! I recently made bath soak with my boyfriend;-))) And keep thinking about using it… Could I just open the container and start enjoying the hot bath? Or waiting till six months is necessary? Hi Charlotte, I don’t usually wait to use my bath soaks. Perhaps the recipe you used will be good up to 6 months. I usually mix them up and use them right away.